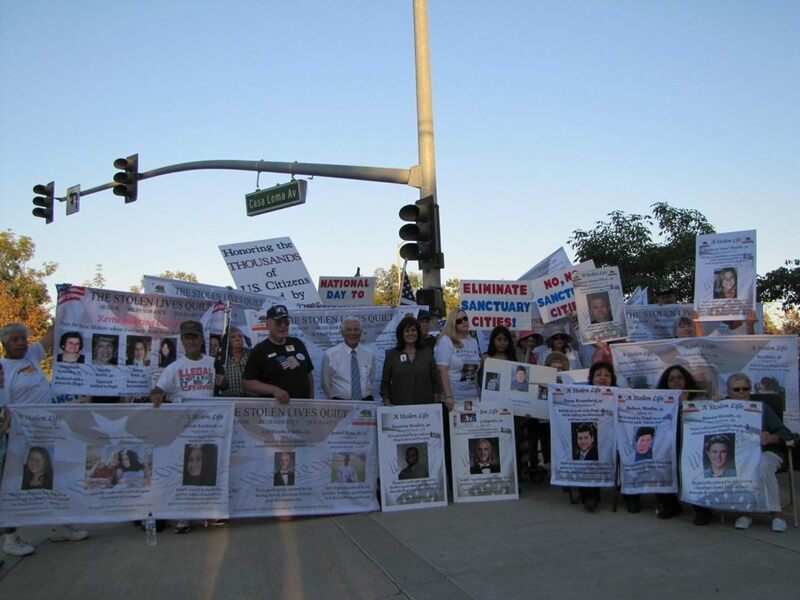 YORBA LINDA, CALIFORNIA — “I’ve been called a traitor” for speaking out against illegal immigration, grieved mother and latina woman Angie Morfin, as she enlightened those gathered at one of many events across the country for the National Remembrance Day for those killed by illegal aliens. Sabine Durden can be seen in the photo above clutching a small jar containing the ashes of her son Dominic. A twice convicted drunk driver and foreign national illegally present in the United States struck and killed the young 9-1-1 operator on July 12, 2012. 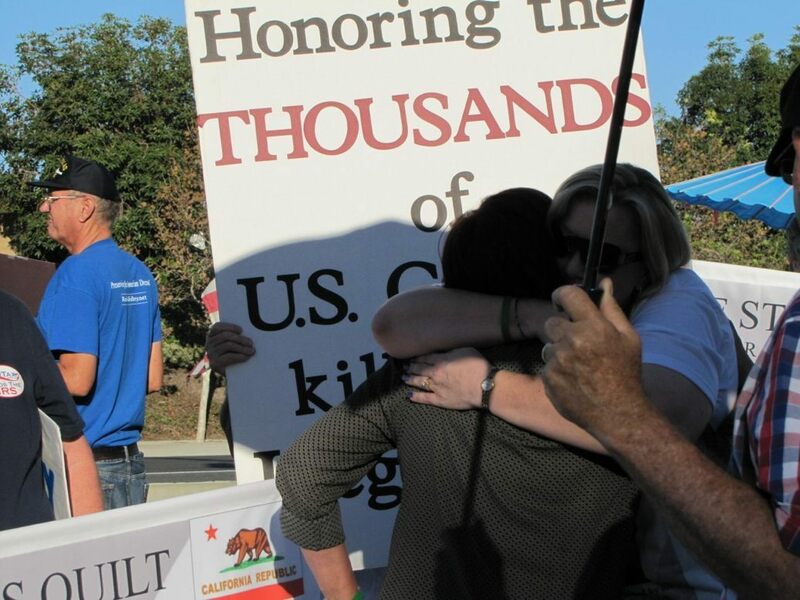 Breitbart News was on scene at the Yorba Linda, California gathering commemorating the National Remembrance Day. Other events occurred in cities across the country including Phoenix, Arizona, Houston, Texas and in New York State. Morfin, mother of murdered 13-year-old Ruben Morfin told the crowd, “I’m serving a life sentence.” She shared how her son was shot in the back of the head by an illegal alien. Doctor’s at the hospital told her half of her little boy’s brain was missing. Young Ruben was in the hospital a short time before passing away. Morfin recalled how her son’s murderer fled the country, but after being featured on America’s Most Wanted, was caught in Jalisco, Mexico in 1994 and was finally sentenced. Brenda Sparks shared the story of her son Eric Zepeda who was killed by an illegal alien. She explained that the individual who hit and killed Zepeda had previously pled guilty to drunk driving three times, but remained in the country and was driving to deliver papers when he hit her son. Zepeda was in a coma for four long weeks before he was taken off of life support. Sparks expressed the shock being told that the offender who was illegally in the country, illegally driving and illegally working delivering papers could only be charged with misdemeanor vehicular homicide without negligence. Sabine Durden recalled her experience legally immigrating to the United States from Germany to those gathered Sunday. She gladly went through the process and was proud to become a citizen. Years later her only son Dominic, also a legal immigrant, was killed by an illegal alien at just 30 years old. She lovingly told the crowd Dominic’s nickname, “German chocolate.” As a half black young man there was no outcry from activists like those that now herald, “black lives matter.” No big headlines appeared for Durden’s son in the mainstream media. A statement was read from Kathy Woods, mother of murdered teen Steven Woods. Young Steve was murdered at the beach after a high school football game in San Clemente, California. The statement recalled three cars of gang members, one of which shattered the passenger window of the car the young man was in and plunged a sharpened paint roller into his temple. The statement from Kathy Woods noted that for over three weeks her son lived in the hospital before he died. The media neglected to report that the gang members who attacked him were illegal aliens. Many of those families who have lost loved ones to illegal alien crime expressed great thanks for 2016 Presidential candidate Donald Trump for helping spark national conversation over their plight following the death of Kate Steinle in San Francisco last July. 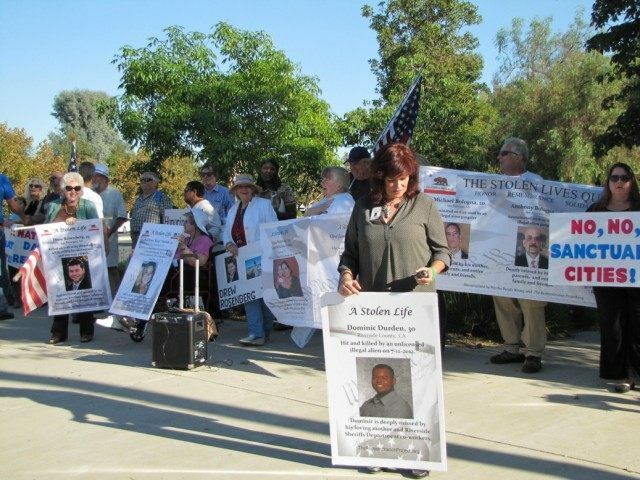 Breitbart News reported from the 2014 National Day of Remembrance event in Temecula California where Moreno, Sparks and Durden spoke alongside the family of murdered young man Jamiel Shaw and Don Rosenberg, father of Drew Rosenberg, killed by an illegal alien. Mary Ann Mendoza recounted the story of her murdered son Sgt. Brandon Mendoza on the Sunday evening edition of Breitbart News radio with guest host Dan Fluette on SiriusXM 125. Mendoza explained that she lost her son when a three times drunk driver illegal alien, who was on meth, slammed head on into Sgt. Mendoza. 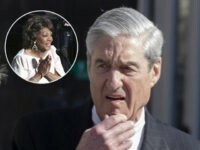 She told the listening audience that many elected officials are not listening to the families that have lost family members to illegal alien crime, but that Rep. Steve King (R-IA) and Rep. Louie Gohmert (R-TX) are among the few who have listened and taken action. Again and again families relayed — if the killer(s) of their loved ones had been deported, as many of them passed through the hands of the justice system, these Americans would be alive today.